This event is an excellent opportunity to strengthen ties between contractors and students who we invite to join our industry. 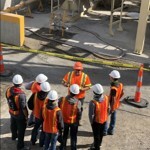 Construction oriented students from area high schools and vocational schools are invited to spend a morning touring construction job-sites and facilities. They will see "first-hand" practical application on how to apply what they are learning in school to the construction industry. They are treated to lunch and will have an opportunity to personally meet our contractors and will learn about the various trade union apprenticeship programs. * Volunteering to ride with students on the school bus. * Sponsoring a student - your contribution will help offset the cost of lunch provided to the students. Sponsorship is $30 per student. Any questions about this event, please feel free to contact LuAnn Weethee at 614-488-0724 or email her at lweethee@ohiocontractors.org. To receive a refund, a cancellation request must be received by Thurs., April 18. No-shows will be billed!